When an accident occurs, there are so many things that are going through your mind. Is there damage that’s happened? Is anyone hurt? What do you do next? It’s these types of questions that are going to be surfacing when you’ve been in an accident, but the last thing that you want is to be unsure of the answer. Today we’re going to be talking about a serious question that many people have after an accident: Should I call the police? Calling in law enforcement can make the situation seem scarier and as if you’re in trouble. The important thing to note is that they are there to help you and ensure that all parties are okay both in the moment and down the road. Keep reading for four situations where you should call the police immediately. As you may have guessed, when there has been an injury in an accident you absolutely want to contact law enforcement and first responders. The important thing after every accident is ensuring that all parties are okay and, if someone is not, that they get the care they need as quickly as possible. The police report is going to provide a lot of information that could assist both parties in the case of the accident being brought to court. For that reason, it’s extremely beneficial for law enforcement to be called as soon as possible. Not every accident results in an injury, but if there is another driver that is involved, you want to make sure that you contact the police. There are a lot of messy situations that can arise from an accident, especially with insurance companies. 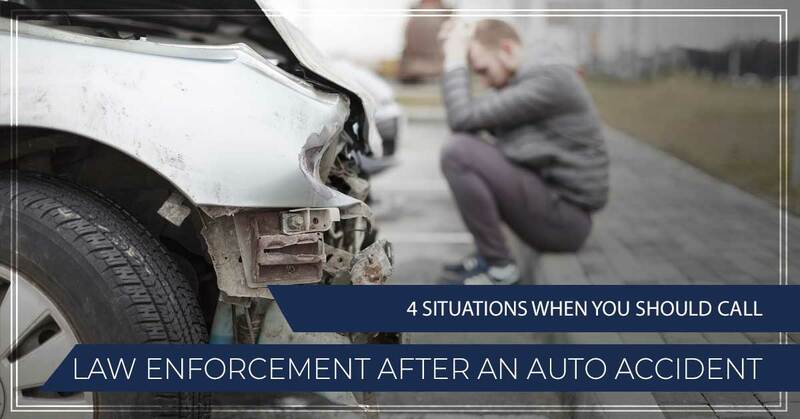 Rather than try to deal with these messes on your own, you can ensure that the accident is filed by law enforcement and that you receive the police report that will be extremely helpful in the case that conflict arises. A majority of the damage that happens in an accident is going to happen to the car. However, that’s not the only thing that can result in damage after an accident. Whether it’s private property or public property that has been damaged, you need to ensure that law enforcement is being called to come and file a report. Again, it can feel as though you’re going to get in trouble when calling the police to come and assist, but the reality is that they are there to help you and ensure that everyone is taken care of after the accident. In reality, you should always call law enforcement after an accident. While the accident may feel the worst of the situation, there are a lot of bad situations that can arise. Police reports are a great way to cover all of your bases and build a strong case in the event of a court appearance. We cannot stress it enough, law enforcement is there to assist you and make sure that you’re taken care of, so do not be nervous or scared! The team at The Edwards Law Firm will be ready to assist you with your case in the case that you need to appear in court. Contact one of our truck accident attorneys for more information on what you should do after an accident and let us know how we can assist you.